Mumbai isn’t the most friendly city to work out in outdoors, but the occasional green spot has been known to surprise us. Here are a few of our favourite spots to build up a sweat when we’re tired of YouTubing aerobic workouts. Priyadarshani Park is one the most popular public parks in Mumbai, so we found that the early hours are the best time to hit it up if we wanted to avoid the crowds. With its sea-facing location, artificial beach, and even a sports complex, it’s worth the early alarm. What’s the Routine: We liked this park because of the many options it has. Besides a walking and running track, we also ran past yoga classes, tennis matches and a martial arts class. The park has both a community centre and a laughter club, so we’re making our next trip here a family affair. Need to Know: After the early mornings, the park gets a little crowded, so we’re going to stick to the first half of the day. We also spied coconut water available at the community centre, a good option for rehydrating after our run. #LBBTip: The park allows dogs, but only between 8am and 9am. 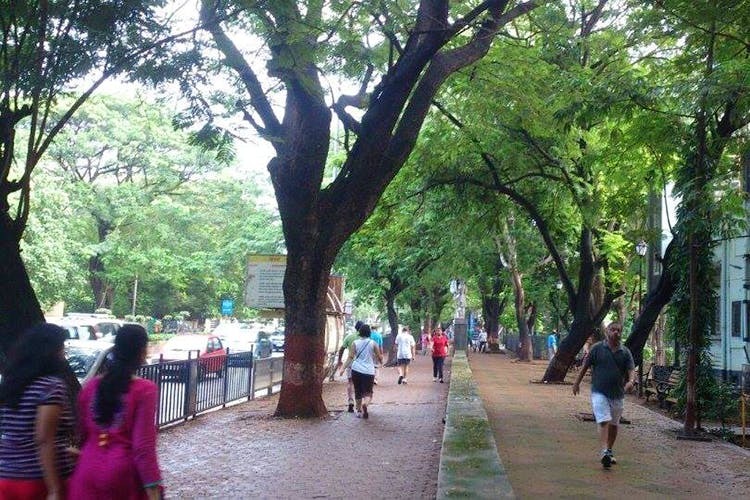 Shivaji Park is a super popular park in Dadar, a safe and hug space for people to walk, run, jog or even work out. Such is its popularity, that you’ll find people there 24*7. What’s the routine: It’s known as a runner’s hub as people are almost always there, running. A myriad of activities go about simultaneously, from football to gymnastics to even old people just taking their evening walk .They have pavements for people to walk on, and separate running tracks for people to run on. Need to know: Since it’s almost always packed, avoid evenings to avoid the crowd. Go their either super early, or post midnight. Also, dogs are not allowed. Popular with the people of South Mumbai, Amarson’s Garden in Breach Candy is a clean, well-maintained garden, perfect for working professionals like us who are looking for calm and serenity. What’s the Routine: Besides a walking path, the park also has a library near the exit. Besides this, they have a play space for children called Harish Mahindra Children’s park, which has a nature’s trail for kids, and lots of swings for the kids to play on. However, the park does not hold any classes or activities. Need to know: It’s a tranquil haven for families, and people looking for a quick run. What’s a suburb without a green backdrop? Hidden in the middle of Powai we found an aptly named park, Nirvana Park. Part of the Hiranandani Gardens, this park is well-maintained with a vaguely Oriental theme, expressed through asian lanterns and a fish pond. What’s the routine: Besides a walking path, the park has a small wooden bridge to cross the pond, and a dedicated space for children. Price: Entry fee for adults INR 5, INR 10 to carry a camera. The famed Joggers Park in Bandra even has a Bollywood film named after it. Easy to get to, bang on the Carter road, this famous park is aptly, a jogger’s haven. What’s the routine: For the active runners, there are three tracks to jog on: tiles track, mud track, and concrete track. Tiles track is perfect for the casual stroller, especially mothers and senior citizens. The mud track is for the experienced regular jogger, and the concrete one demands really good pair of running shoes. Need to know: The park has washroom facilities. Be weary, the park gets really crowded during the evenings, and weekends. Pets are not allowed. When we’re in the mood for something on the wilder side, we’re heading to Forest Park. A landscaped park that gives us major ‘Into The Woods’ vibes, Forest Park is the place to be after a bout of rain. What’s the routine: We liked the walking path in Forest Park which is well-maintained and even. The park is open all day and everywhere to anyone, including pets. Need to know: The tracks may get muddy during Monsoon, so wear waterproof shoes. The tracks are not lit, so carry a torch for late evenings and nights. One of our favourites is the the Bombay Port Trust (BPT) Garden, or otherwise called, Sagar Upvana. A beautiful 12 acres green spot at the tip of South Bombay,this park is maintained by the Bombay Port Trust and maintained with the help of the World Wildlife Fund (WWF). It shows — this park is a nature lover’s dream come true. What’s the Routine: The garden has long walking and jogging tracks that are paved across the garden and lined by trees. The garden has sea-facing benches we enjoyed after our run, as well as a spectacular view of the sunset. Need to Know: Senior citizens often flock to his serene garden, early in the mornings and for their early evening session, and entry is free for them. Occasional school excursions trips happen here too. The garden is open to all, except no pets are allowed here. Bang in the middle of Matunga is the circular Maheshwari Udayan or the King’s Circle Garden. Once we entered the garden, we noticed how trees and plants were in abundance, easy to forget it’s in the middle of a busy area. There’s a water fountain directly under the flyover, but hardly ever works. Apart from this, we found it relaxing and calming. Street vendors selling ice cream, and light snacks will often make their way into the garden, a delight for the kids and the older people alike. What’s the Routine: Jog, do a brisk walk, or even workout in this green spot, like we did. It has swings for the kids as well. Need to Know: Heads up, the park often gets overcrowded during the evenings, owing to it being the only green spot in that area, but mornings are pleasant and less crowded.